The Buddy Walk was developed by the National Down Syndrome Society (NDSS) www.ndss.org in 1995 to celebrate Down Syndrome Awareness Month in October and to promote acceptance and inclusion of people with Down syndrome. 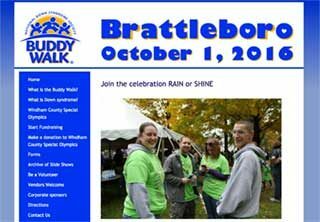 A friend with Down syndrome asked me in 2009 if I could help the Brattleboro Buddy Walk group with a website to advertise their walk, and help with some form of online registration. I’ve been working with Jim Nicholson, the Brattleboro Buddy Walk coordinator ever since, through several versions of Joomla, and updates to the Event Booking plugin. I’m happy to donate hosting and maintenance of this site for this local organization.